A large dusty rose pink single flower with pale yellow undertones and deep rose veins; crinkled petals add texture; height from 3 to 5 feet with a spread from 3 to 4 feet, very hardy; large divisions from mature plant. (Saunders 1948) Large apricot-peach with red coloration towards the edges of the petals; single to semi-double blooms stand above the foliage; as the bloom matures it becomes creamier in the interior; height about 4 ft. Shipped with stems cut down to fit in a large flate rate box,, but if you want stems intact please make arrangements for whatever the increase in shipping. After ordering online, call us with your credit card information. (Origin Unknown France ) Most magnificent 10 inch lavender pink blooms on a shrub that gets 6 to 8 ft. tall; the petals are veined a deeper shade; a small circle of golden stamens surround the purple carpels; very floriferous and the blooms long lasting. (Daphnis) Redon is unusual in that each plant bears flowers of two distinct colors--some will be pale pink suffused with cream and yellow, while others will be peach; a rare plant and one of the largest tree peony flowers averaging about 10 inches or more, carried well above a short plant about 30 inches; in our experience the blooms are moderately pendant and excessively gorgeous; a few divisions from mature plants. 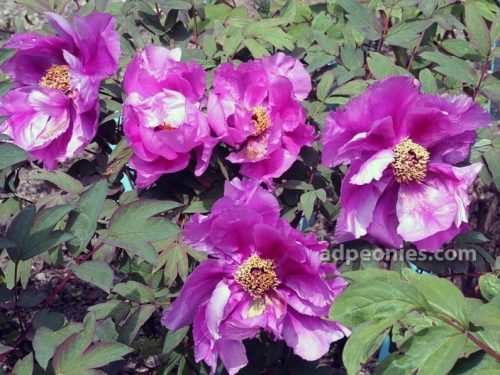 (Japan) This enormous lavender lilac suffucticosa is a semi-double with dramatic deep black purple flares that highlight the petal base; vigorous upright growing plant to more than 5 ft.; hardy like a rockii and a prolific bloomer.